A walk generally results in a one-base award to the batter and any forced runners, but what happens when a runner entitled to advance is tagged on the way into the next base while attempting to steal it? Even with the base? Past it? 2B Umpire Laz Diaz observes the action. Such a scenario occurred in Houston, when Astros second baseman Jose Altuve attempted to tag Mariners baserunner Jean Segura during a stolen base attempt on a walk. The Play: With none out and one on (R1), Mariners batter Mitch Haniger faced a 3-2 count as baserunner Segura extended his lead off of first base in anticipation of a run-with-the-pitch situation. As Astros pitcher Joe Musgrove released the payoff pitch, Segura took off towards second while Haniger attempted to check his swing on a chest-high fastball, ruled a ball by HP Umpire Cory Blaser and affirmed as "no swing" by 1B Umpire Jeff Nelson. As Blaser and Nelson made their respective calls, Astros catcher Brian McCann threw to second baseman Jose Altuve in an attempt to retire baserunner Segura, in the event that the pitch were to be ruled a third strike. Although the outcome of the at-bat was indeed a walk, forcing Segura's protected advance to second base (which explains why Segura's sprint turned into a jog as he approached second base), Altuve nonetheless tagged and chased the startled Segura, who in turn veered to the left field side of second base in an attempt to avoid the tag. After confirming from Blaser that the pitch was indeed ball four, 2B Umpire Laz Diaz made no call and allowed Segura to return safely to second base. Case Play Question: At what point, if any, might Segura be declared out, and if he is liable to be declared out, under what rule would that fall (e.g., out on the tag, out of the base path, abandonment, etc.)? Does Altuve's actions in attempting to tag the forced-to-advance without liability to be put out Segura have any bearing on this ruling; what would have happened, all else equal, had Altuve kept the tag on Segura the entire time? 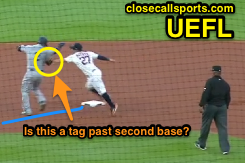 What if Altuve hadn't kept the tag on, but continued to chase Segura as he ran past the base? Answer: Segura may be declared out if he is tagged after passing the physical location of second base, whether or not he actually touched the base (5.05(b)(1)). Altuve's actions have no bearing on this play: deception is not obstruction in professional baseball, it is a legal play (had Altuve prevented Segura from seeing the play, THAT would qualify as obstruction, but evidence suggests no such illegal action occurred). Had Altuve kept the tag on Segura the entire time, Segura would be declared out if, in the umpire's judgment, Segura's overrun of second base was of his own volition (e.g., Altuve did not physically push Segura past the base). Had, all else equal, Altuve not kept the tag, but continued to chase Segura past the base, the umpire's use of discretion would dictate whether or not Segura illegally exited his base path for the purpose of avoiding a tag (5.09(b)(1)). OBR 5.05(b)(1) Comment: "If, in advancing, the base runner thinks there is a play and he slides past the base before or after touching it he may be put out by the fielder tagging him. If he fails to touch the base to which he is entitled and attempts to advance beyond that base he may be put out by tagging him or the base he missed." OBR 5.06(b)(3)(B): "Each runner, other than the batter, may without liability to be put out, advance one base when—The batter’s advance without liability to be put out forces the runner to vacate his base, or when the batter hits a fair ball that touches another runner or the umpire before such ball has been touched by, or has passed a fielder, if the runner is forced to advance." OBR 5.06(b)(3)(B) Comment: "A runner forced to advance without liability to be put out may advance past the base to which he is entitled only at his peril." OBR 5.06(b)(4)(I) Comment: "The fact a runner is awarded a base or bases without liability to be put out does not relieve him of the responsibility to touch the base he is awarded and all intervening bases." OBR 5.09(b)(1): "Any runner is out when—He runs more than three feet away from his base path to avoid being tagged unless his action is to avoid interference with a fielder fielding a batted ball. A runner’s base path is established when the tag attempt occurs and is a straight line from the runner to the base he is attempting to reach safely." OBR 5.09(b)(1) and (2) Comment: "PLAY—Runner believing he is called out on a tag at first or third base starts for the dugout and progresses a reasonable distance still indicating by his actions that he is out, shall be declared out for abandoning the bases."